Custom and Cheap Lamp,LED Tester Supplier and Manufacturer. testing wtta,power factor,current,and annual power consumption for LED CFL lamps.Quick and precise lamp tester. LITE AC power meter is a very practical lamp tester to make you more professional to identify the good and bad quality of lighting products. 1. 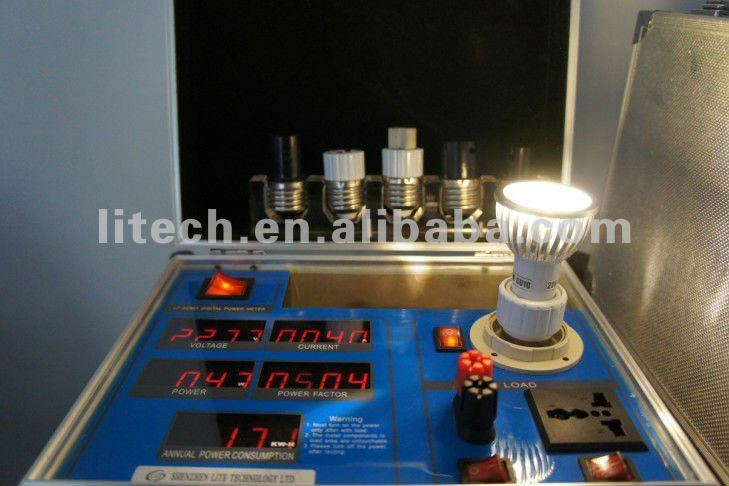 It's practical tester to identify or compare the quality of LED lamps,fluorescent lamps, halogent or incandescent lamps,or appliances from AC 100 to 277V within 300W. 3. Equiped with different converter for E27, E14, B15, B22,MR16, GU10, G9.Could test different bulbs with different bases. 2. Testing time is only about 10 seconds. 3. Testing error is within 3~5%.4. With precise test data and competitive price.5. Maximum testing wattage:300W6. 1 year replacement warranty.